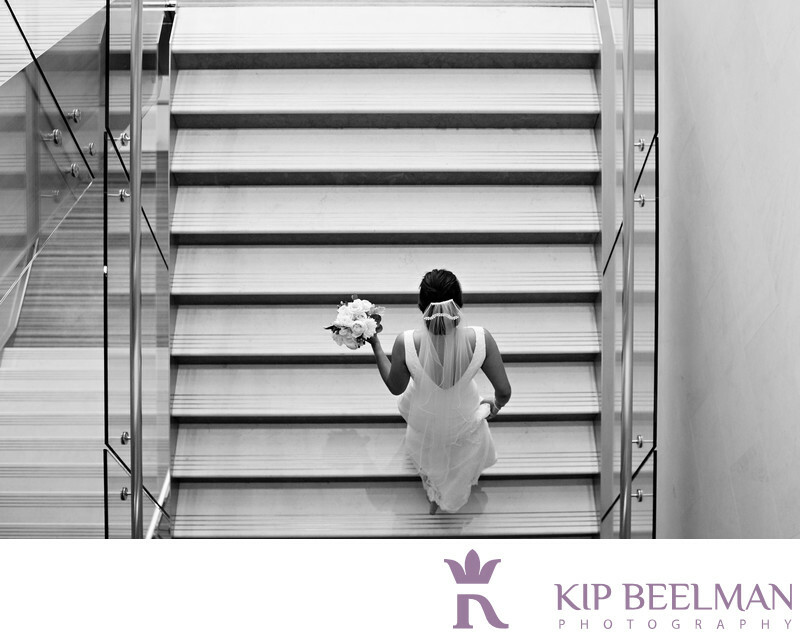 “And she’s buying a stairway to heaven…” Hyatt at Olive 8 wedding photography included this hopeful, ascending image that I took as the bride began on her way to see her first glimpse of the groom on their wedding day. The bride is climbing slowly but surely towards her future and her future husband with a beautiful dress, beautiful veil, beautiful bouquet and beautiful movement. I love how you can almost see the top of the stairs, but are drawn back to the bride. Located in Seattle, the sleek and modern Hyatt at Olive 8 and the warmth of the hip, vital surrounding area provided some fantastic locations for relaxed, natural portraits of the bride and groom along with their wedding party, including some great black and white shots like this one. The first LEED certified hotel in Seattle, the Hyatt at Olive 8 represents the best of the Pacific Northwest with its innovative green features, stunning skyline views and a vibrant atmosphere in the heart of downtown. The hotel is just minutes from Pike Place Market, the Puget Sound, the Seattle Seahawks stadium and a wealth of Seattle culture and events. After a lovely wedding ceremony, the DJ and MC for the reception was the incomparable Austin Beaver, who helped to spark a party atmosphere complete with a vodka luge and the groomsmen stripping to their boxers late in the night. From these first steps to some wild dance steps later on, it was a day of vibrant energy and wedding photography and of moving forward with joy. Location: 737 Olive Way, Seattle, WA 98101.